Provides wrist & thumb support with one brace. Perforated & wicks moisture away from your skin. Dual lacer closures around the wrist. The MedSpec Ryno Laceris designed to accommodate all different types of injuries to the wrist and thumb region. Two single pull lace closures are used to cinch up the brace easily for support and comfort. The brace features a perforated suede outer covering and a soft inner polypropylene fabric liner that feels soft against the skin. It effectively wicks moisture away from the skin to keep you cool and dry. An inner stockinette bridges the opening under the lacing system for comfort while lacing up the product. The Ryno Lacer features a full length radial stay along the outside of the thumb, an aluminum palmar stay on the palm side, and a more flexible stay on the dorsal top side to provide complete immobilization. Use it to treat tendonitis, sprains, and recovery after wrist/thumb surgery. Provides effective wrist & thumb immobilization for a variety of injuries. Two singe pull lace closures make it significantly easier to apply the brace. Malleable aluminum radial and palmar stays provide superior support. Wrap around thumb strap provides superior thumb stabilization. Uniform circumferential pressure for overall better feel and support. Perforated suede improves evaporation of perspiration; provides cool comfort. Polypropylene felt inner material wicks moisture away from skin. Stockinette inner sleeve feels better against skin underneath the lace area. Adjustable thumb strap for individual adjustment, providing a better fit. The Ryno Lacer is manufactured in the US for greater quality control. Available in five sizes - please see our sizing chart tab for important measurement guidelines. 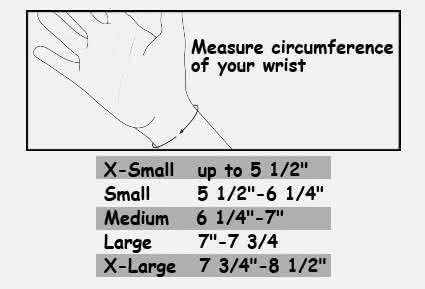 Sizing Chart: Measure wrist circumference as shown below. Polypropylene material for moisture wicking capability. Perforated suede on the outside for lightweight comfort and durability. Inner stockinette for comfort under the lacing closure system and prevents the brace from opening up and falling off as the lacing system is opened. Exactly what I needed and expected. Great service and a very good product. Thank you. I use the MedSpec Reno Lacer Wrist and Thumb Support at night for support to my thumbs. I have arthritis in both thumbs and this brace works great. Easy to put on and take off. Provides excellent stress relief for my thumb and wrist at night making work much easier the next day. I could feel the difference after the first night.